Today was yet another amazingly beautiful, sunny day in Macedonia’s capital. In fact, I haven ‘t seen a drop of rain since I got here. This is given the fact that the flowers in the flower market are beautiful, the wheat crop is up 40% over last year, and Macedonia is willing to give up its name and turn itself into “New Macedonia” for a chance of getting candidacy in the E.U. 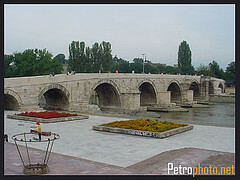 Yet if you saw the amazingly beautiful city of Skopje, you would think that this was a paradise with its stone bridge from early Ottoman times, its amazing stone fortifications, its beautiful river Vardar, of which the citizens are so proud. It is these and more images that the students wrote about in their Ekphrasis assignment. Ekphrasis is writing an extended definition, and it is from the Greek, but it has come, by custom if nothing else, to mean writing about art, and that is what my students did today. They did an absolutely amazing job given that each and every one had to write a poem using Ekphrasis in a language which is their second, third or fourth language. First I had them read Keats’ Ode on a Grecian Urn and Auden’s Musee de Beaux Arts, and then they began. I will send you the results on Monday. They did a great job. Tomorrow I have the day off so I am going to walk their stone bridge (the original bridge on the site was Roman) and then I will tell you the difference between seeing image and walking the stones. Until Monday then. that’s all from the Macedonian Express. I wish that you could walk the stones with me tomorrow.